Weather forecasts are barely reliable a week out, so how can climate models tell us what will happen 100 years from today? We can't predict what the weather will be like on a given day in the year 2100 — but we are very confident the world will be a lot warmer. Does a motorcycle accident down the street mean you can’t operate your electric car safely? No. In much the same way, “incorrect” weather forecasts don’t tell us much about the reliability of climate projections. Weather forecasters and climate scientists don’t look at the future the same way. A weather forecaster in New Jersey, for example, is interested in the chance of rain in Hoboken three days from now. On the other hand, a climate scientist is interested in whether the state of New Jersey will be wetter or drier on average 40 or 50 years from now. Much like a motorcycle and an electric car, weather and climate models include similar “parts," but they start with different kinds of data and are operated in different ways. Climate scientists can’t tell you with certainty how much the world will warm in 100 years. But they can say with certainty that the world will continue to warm. And the more carbon pollution we put in the atmosphere, the worse things will get. This argument betrays a misunderstanding of the difference between weather, which is chaotic and unpredictable, and climate, which is weather averaged out over time. While you can't predict with certainty whether a coin will land heads or tails, you can predict the statistical results of a large number of coin tosses. Or expressing that in weather and climate terms, you can't predict the exact route a storm will take, but you can predict the average amount of rainfall a given region will get in a year. Climate prediction is a difficult art that's constantly being refined. There's the problem that future behavior of the sun is very difficult to predict. Similarly, short- term perturbations like El Niño or volcanic eruptions are difficult to model. Nevertheless, climate scientists have a handle on the major drivers of climate. Way back in 1988, James Hansen projected future temperature trends. Those initial projections show remarkable agreement with observations right to the present day (Figure 1). Figure 1: Hansen's model projections (green, blue, purple) compared to observations (red and black). Adapted by John Cook from © James Hansen et al., "Global temperature change," PNAS 103 (206): 14288–14293. 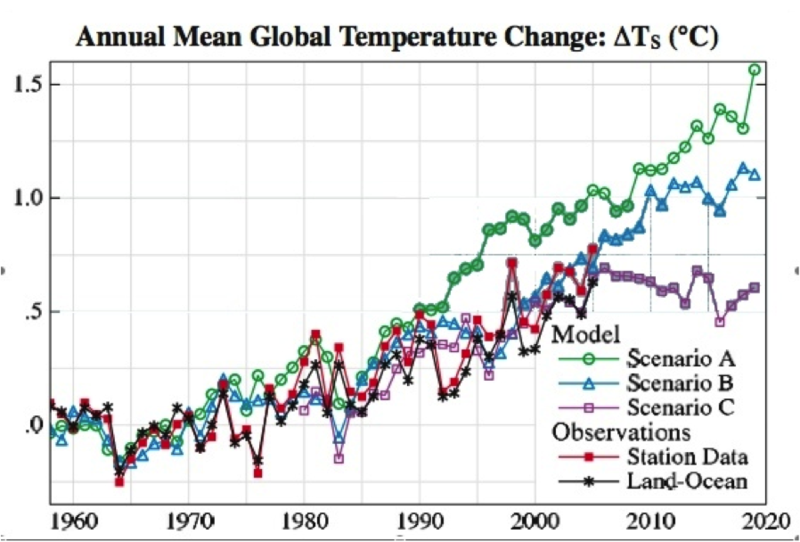 Hansen's Scenario B (described as the most likely option and in hindsight, the one that most closely matched the level of CO2 emissions) shows close correlation with observed temperatures. There are deviations from year to year, but this is to be expected. The chaotic nature of weather will add noise to the signal but the overall trend is predictable. When Mount Pinatubo erupted in 1991, it provided the opportunity to test how successfully models could predict the climate response to the sulfate aerosol injected into the atmosphere. The models accurately forecast the subsequent global cooling of about 0.5 degrees Celsius soon after the eruption. Furthermore, the radiative, water vapor, and dynamical feedbacks included in the models were also quantitatively verified (Figure 2). 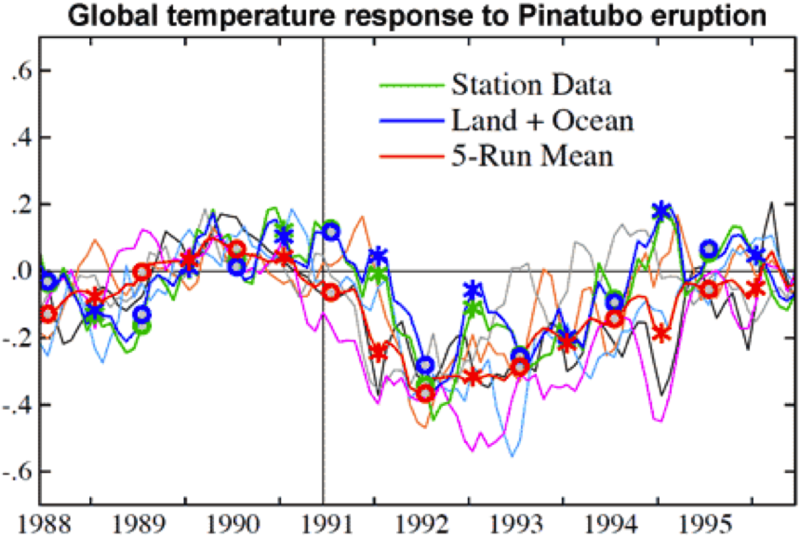 Figure 2: Observed and simulated global temperature change during Pinatubo eruption. Green is observed temperature by weather stations. Blue is land and ocean temperature. Red is mean model output. Reprinted with permission from Gavin Schmidt and Physics Today: “The physics of climate modeling,” January 2007: 72. © 2007 American Institute of Physics. 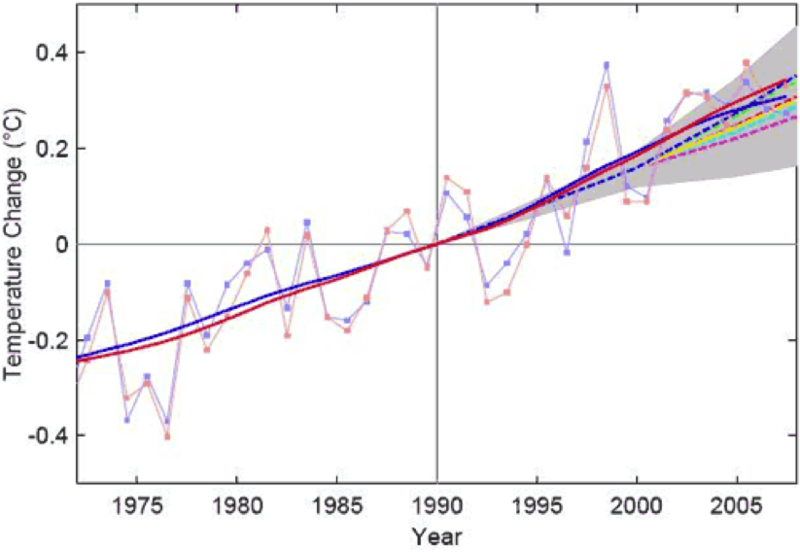 The study “Recent Climate Observations Compared to Projections” compared projections made by the IPCC in 2001 of global temperature change (colored dotted lines) with observations from HadCRUT (blue) and NASA GISS data (red) (Figure 3). The thin lines are the observed yearly average. The solid lines are the long-term trends, which filter out short-term weather fluctuations. It's immediately apparent the IPCC underestimated temperature rise with observations warmer than all projections (but within the grey uncertainty area). The paper proposes several possible reasons for the difference. One is intrinsic internal variability which is possible over such a short period. Another candidate is climate forcings other than CO2, such as aerosol cooling, being smaller than expected. A third candidate is an underestimation of the effects of amplifying feedback loops in the climate system, like the loss of Arctic sea ice or an increase in water vapor. You can learn more about the IPCC’s 2001 projections here.